“I reached a plateau.” Jacqueline isn’t the first person who exercises who has made this statement or recognized this situation in herself. She worked out at a co-ed Goodlife for years, enduring the long treadmill runs and weight machines. She didn’t do the classes because she didn’t have a feel for them. She suddenly sought out kickboxing because she wanted to try something completely out of her comfort zone. She looked it up and found HERS and what she gravitated towards was the all-female aspect of it. “Everyone is there to better themselves and to support each other – the sense of sisterhood and collegiality is undeniable”; and it is felt by HERS members as soon as you walk through the front doors. What Jacqueline loves most about HERS, is that it isn’t just a regular gym where you drag yourself to work out and leave without really connecting with other members. 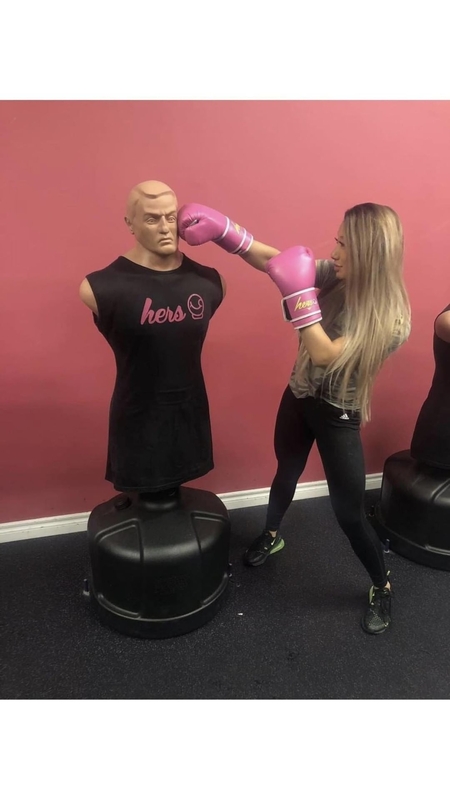 Instead, HERS is a very intimate and personal experience, where you really feel like the HERS staff and instructors are there to see you succeed. Whether it’s following up with you if you miss a class, cheering you on during your workout or cooking tips and recipes via Instagram (I see you Cristina! )- what sets HERS apart is how much they genuinely CARE about their members and want to help them achieve their personal fitness goals. Jacqueline’s first class was with Suzanne and she was aware that HERS had a variety of levelled classes. Her trial class was Super Sculpt, a notably high level of class. “Suzanne was patient and stood by me coaching me with technique.” Funny enough, after trying a variety of classes (often back to back), Super Sculpt is Jacqueline’s favourite. It is intense, but the results show. Her heart rate zooms up and stays there with most of the time in the red. Jacqueline also really enjoys Taboxing, due to its variety of different combination exercises. With twenty seconds of hard work and so many exercise combos, the 45 minute workout flies by. Over the past six months, Jacqueline has seen and felt a great change to her body and mind. She has always had an issue with weight – never truly feeling or seeing real results. Having always been confident, the 33-year-old now feels even stronger and empowered. The hits her B.O.B. (body opponent bag) takes as a result of a hard day as a family lawyer is a great way to take out her aggression. Even her diet has become less regimented because her unlimited package of classes give her a constant calorie burn. She used to count macros religiously, tried a plethora of various fad diets and supplements and when she didn’t get results, it was extremely upsetting and discouraging. Now because of her passion for HERS and a kickboxing lifestyle, she doesn’t need to track. Jacqueline includes a lot of veggies and lean protein in her meals as well as carbs like peanut butter, quinoa, and sweet potatoes. She goes with an “intuitive sense of eating” and knows that cutting calories won’t get results. FOOD IS FUEL! Instead, if she has overindulged, she just tacks on another workout. After all, life is all about BALANCE and you gotta LIVE YOUR LIFE and BE HAPPY. Jacqueline puts in eight to ten hours a week at HERS and it has become a part of her routine. “It’s easy to be scared of the unknown. You never know what you’re capable of until you try.” 2019 is a new year and February is the start of the lunar year. You owe it to yourself to try and then to try a bit more! Jacqueline gave it a shot and found that she LOVED kickboxing! What about you? Are you up to TRY?